Requested for a movie, this quilt came out even though the movie didn't. It is a combination of old and new and your fabric selections will make it yours. The pattern will be emailed to you in a pdf file after purchase. Triangles explode in this garden of color. The birds love this garden and so will you. 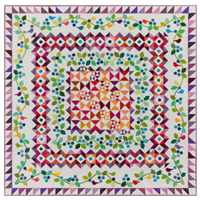 Carefully choose your favorite colors from your stash to make this quilt your own. The pattern will be emailed to you within 48 hours following purchase. 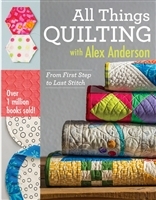 Here is the ultimate "Go To" resource guide for All Things Quilting - The Alex Anderson way. From first step to last stitch this wonderful resource covers everything for today's quilter. Expand your quilting experience and fatten your tool belt with Alex's newest publication.